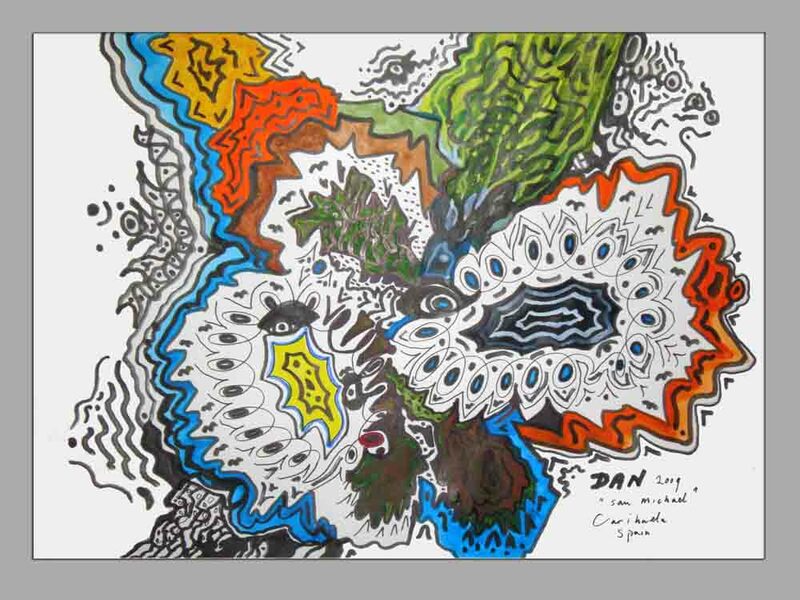 Inspired by a new cosmological perception, DAN’s Art is a fundamental expressionism’ related to his cosmological Double Torus Theory emergieng Big Bang-universa in a hologram-universe. 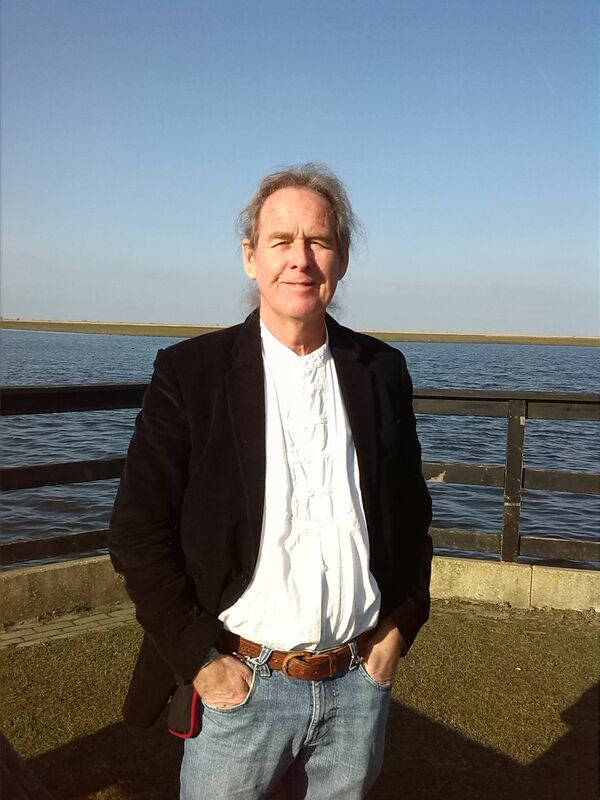 As an independent cosmologist he publishes his 'papers’ in the vixra-archive. I registered my Art with a scientific term ‘duonism’, as an extension on 'dualism'. 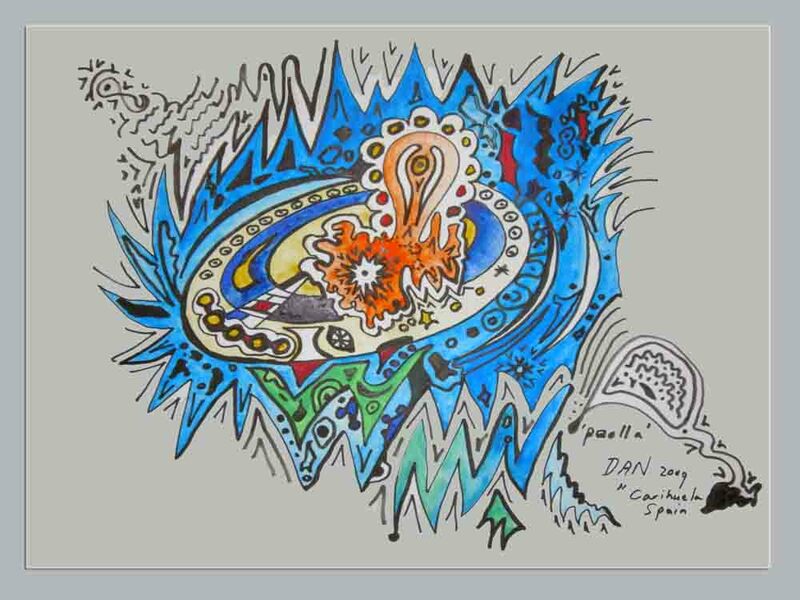 Nydia de Keyzer wrote: "DAN’s Art expresses the merging of a cosmology, physics and spirituality. 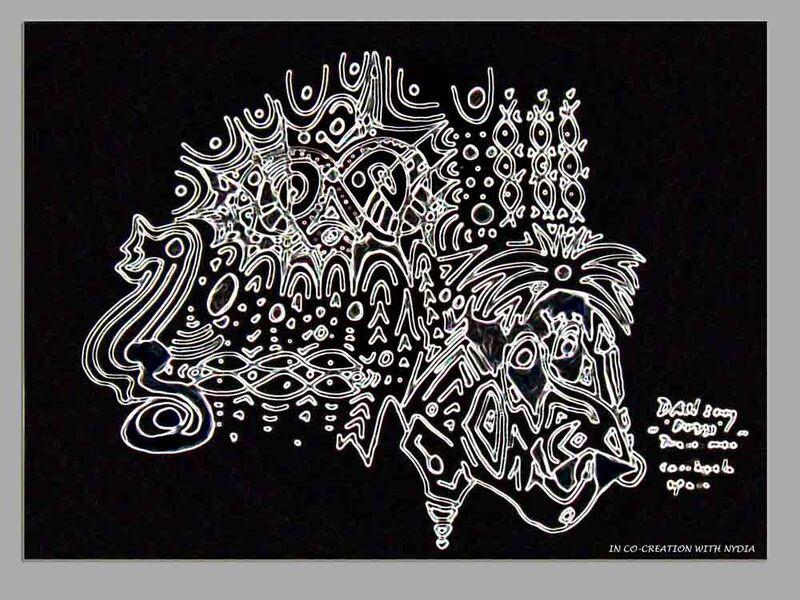 He applies and translates his images and themes through his hypersensitive and cognitive abilities. 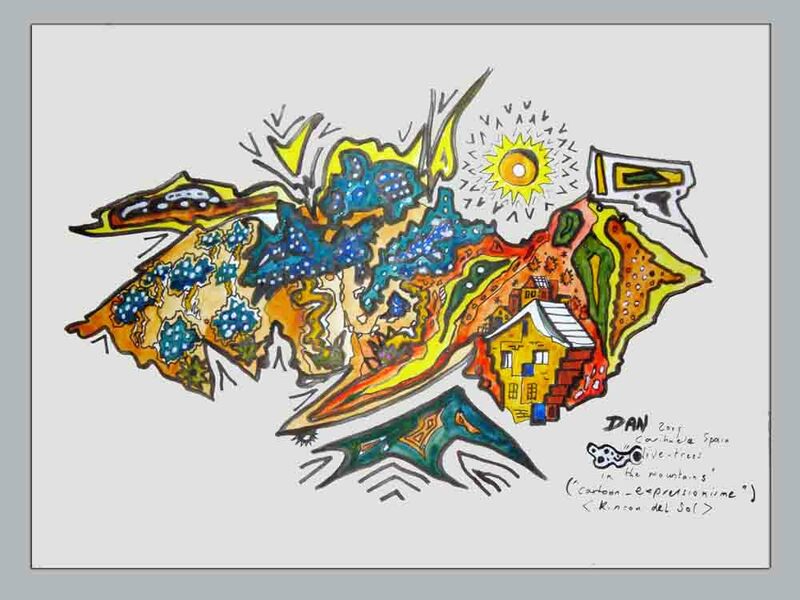 Painting is his personal spiritual platform by forming the scientific cosmological buildingblocks. In this process he gains deeper understanding, based on his formulas representing cutting edge theories of dark matter and dark energy. He perceives this as a deeper underlaying spiritual and meaningfull reality". 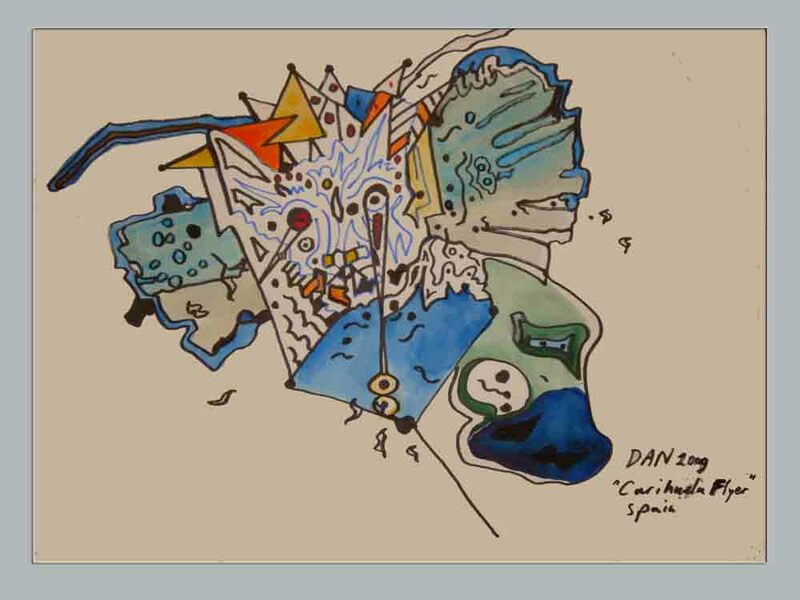 DAN Paintings: The Spain collection. "Torus Flamingo", Carihuela, Spain, DAN 2012 (juridical terms applied). Price 2400 Euro. During my stay in Carihuela I made a painting about the ‘Flamingo’ world .This means: The ‘torus’ is part of my new scientific theory, a universe other than the Big Bang and represents renewing of daily life by means of a physical process based on ‘extra time’, a phenomenon which is prohibited in the Big Bang. 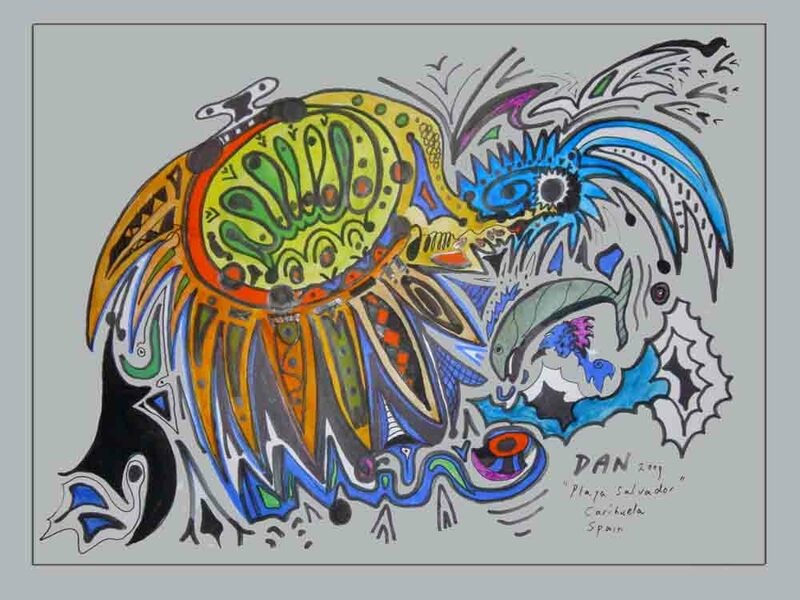 The ‘flamingo-women’ in this ‘torus-painting’ expresses the changes that Spain and Europe has to make in a new universe. "De Wandelaar" (the Walker), Carihuela, Spain, DAN 2011 (juridical terms applied). 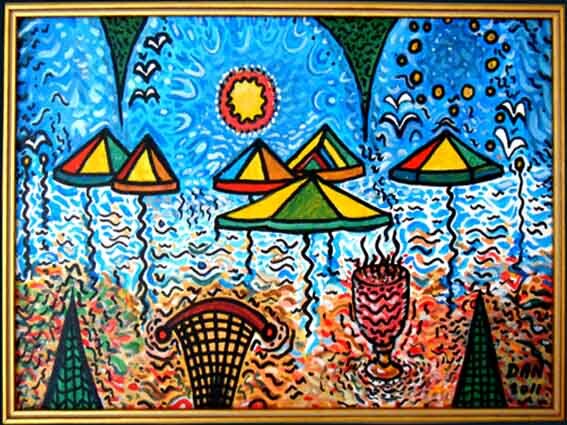 "Parasollen in de Hitte" (Parasols in the Heat), Carihuela, Spain, DAN 2011 (juridical terms applied). "Carihuela Spain", DAN 2009 (juridical terms applied): particulier bezit R. en J. Vrees (Vries). 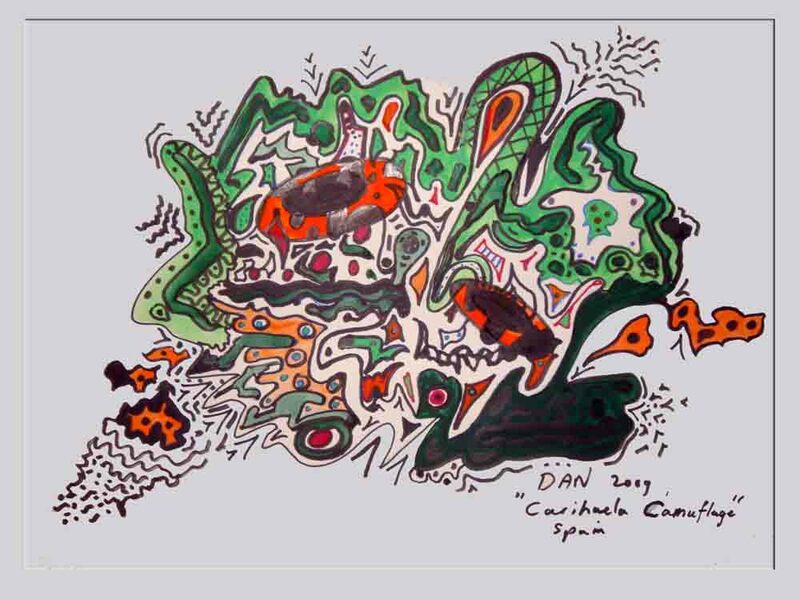 "Carhuela Camouflage", DAN 2009 (juridical terms applied). 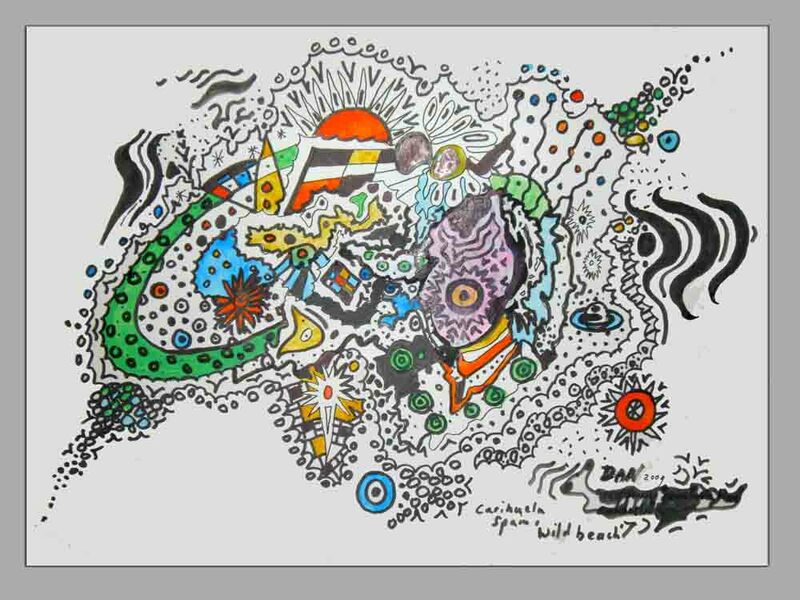 "Carihuela Flyer", DAN 2009 (juridical terms applied). 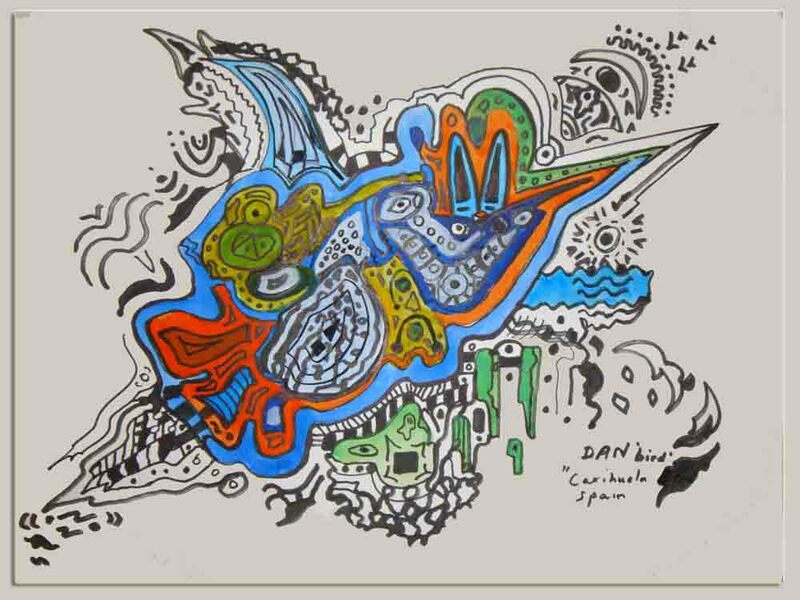 "Carihuela Paella", DAN 2009 (juridical terms applied). 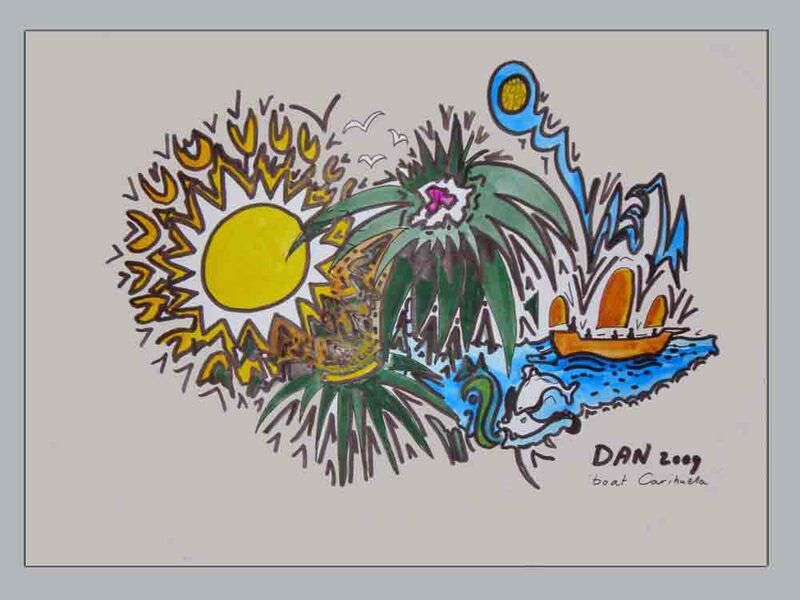 "Carihuela Boat", DAN 2009 (juridical terms applied). "Fog Carihuela", DAN 2009 (juridical terms applied). "Carihuela Life-trees", DAN 2009 (juridical terms applied); pariculier bezit "naam onbekend", Almere. "Playa Salvador Carihuela", DAN (juridical terms applied). 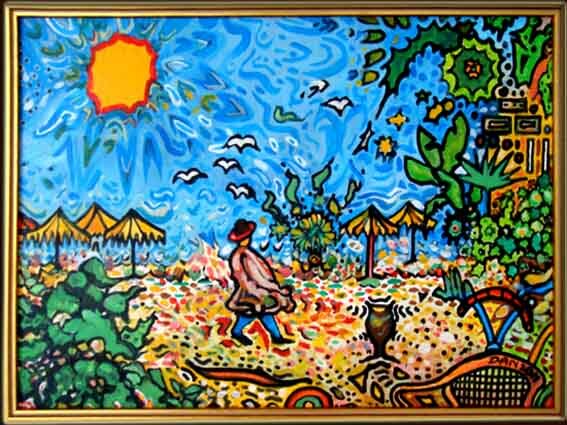 "Playa Miguel Carihuela", DAN 2009 (juridical terms applied); particulier bezit J. Toorneman, Bergen (n.h.). "VIrginia Carihuela", DAN 2009 (juridical terms applied). 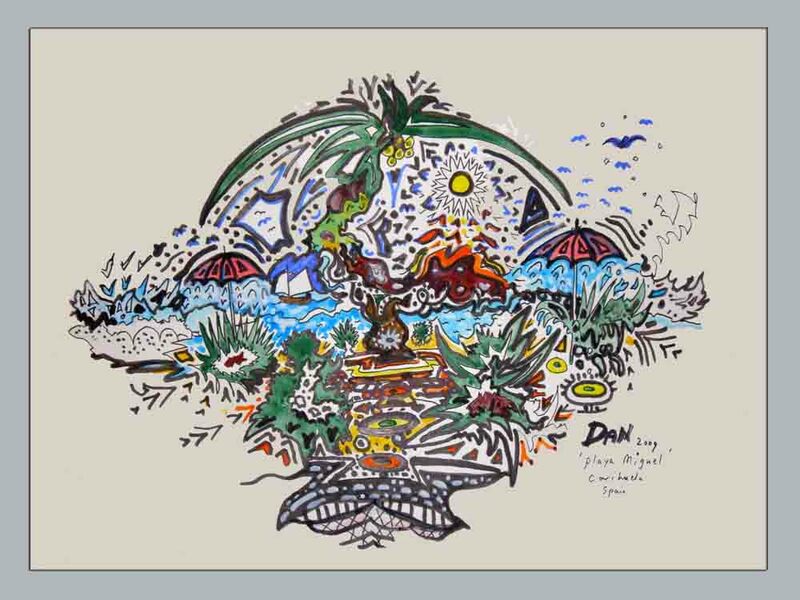 "Wild Beach Carihuela", DAN 2009 (juridical terms applied): not available (in private collection). 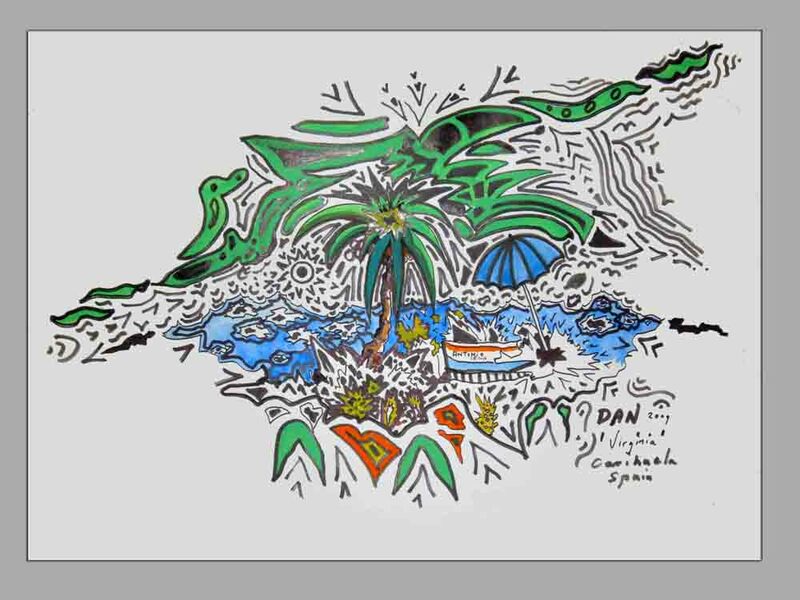 "San Miguel Carihuela", DAN 2009 (juridical terms applied). 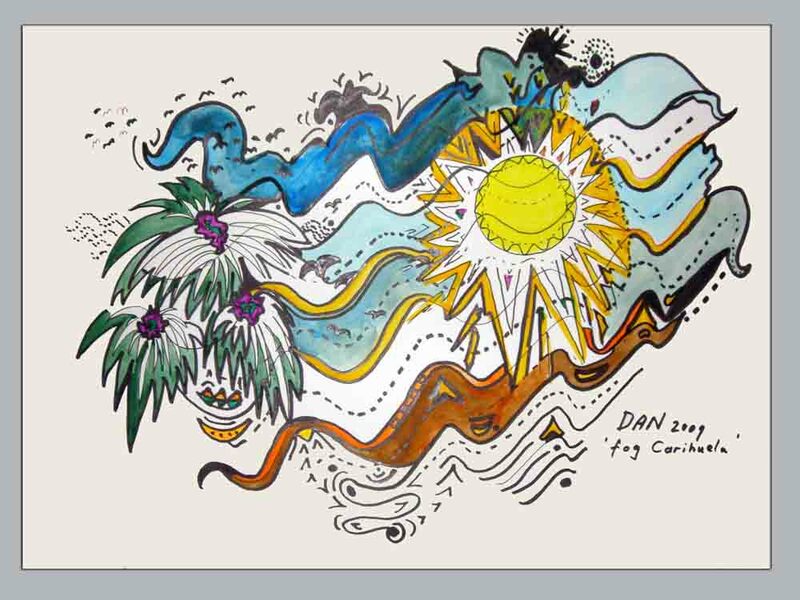 "Doggy Carihuela", DAN 2009 (juridical terms applied). only available in positive.